Our group hiking up towards the lava tower. -Is a dormant volcano with three volcanic cones. Kibo, Shira and Mawenzi. -Shira and Mawenzi are extinct but Kibo laying dormant could erupt anytime. -One of the 7 summits. -Has 5 climate zones. Bushland, Rainforest, Moorland,Alpine desert and Arctic. Flying into Tanzania had me reeling with different emotions. What am I going to see, who will I meet, am I going to finish what I started here, are my loved ones going to be proud of me, and what am I going to learn about myself? I stayed in Moshi which lays at the base of Mt. Kilimanjaro. The day before the trek was for picking up last minute trekking needs and to explore what Moshi had to offer. Waking up the day of the trek I had little sleep but so excited to start this journey. I chose the Machame Route which is 62 km from the Machame Gate to the Mweka Gate. It is one of the most popular routes with great success rate and took us 6 nights and 7 days. 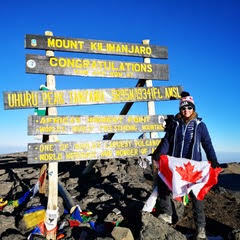 Though the climb is not technically challenging the high elevation, low temperatures and occasional high winds can make Kilimanjaro a difficult trek. We arrived at the gate which was bustling with activity. Porters and hikers everywhere. A bite to eat and photos at the gate and we were off and reminded to go Pole Pole. This is pronounced Polay Polay which means slowly slowly in Swahili. A term heard constantly on the mountain. The next days brought me a lot of peace. I always find that when I hike in the mountains. Everything slows down and I focus on the here and now and quiet my mind. I found the trail enjoyable and not difficult at all. On day three we had our first acclimatization day which was a long slow hike up to the Lava Tower (4600 m) for lunch and then a long slow hike down to Baranco Camp (3900 m). Acclimatization is required and even the experienced and physically fit trekkers may suffer some degree of altitude sickness. You climb high and sleep low. If we were going to start to see signs of altitude issues this would be a day to see it. I felt well and could only feel the altitude effecting me if I moved too quickly so Pole Pole I continued. The only real steep sections of the mountain I found were climbing the Baranco Wall and on summit night. The Baranco wall was a hands on climb and very busy with the porters and climbers having to stop and take turns passing though tight sections. It amazes me how the porters scramble up all sections of this mountain with what looks like little effort and carry a good 30 lbs on their head and then their own gear on their backs. Leading up to summit night the days and evenings were cooling of considerably and the winds were getting stronger as we arrived at Barafu Camp (4673 m) also known as base camp. When the sun was out and the winds were low we soaked up the heat. We settled in at base camp with a hot lunch, briefing of the night ahead of us and rest. We were to get up at 10:00 p.m. for a bite to eat and then set off for the summit around 11:00-11:30 p.m. Feeling extremely nervous and anxious did not help with rest at all. I just kept playing over in my mind what the mountain would offer up to me in the hours ahead. Reminding myself that I am strong and have braved many obstacles in my life and that this is just that. We set off at 11:30 p.m. on the evening of March 7th, 2019. Five of us ladies, three guides and two porters. Our spirits were high and our energy good as we went Pole Pole towards the summit. I had five layers on my upper body, three on my lower, a couple pairs of socks with foot warmers, gloves with hand warmers, my balaclava and toque. I still found the ripping winds and freezing temperatures coupled with the lack of oxygen a mentally draining challenge. With only the light from my headlamp and the voices of encouragement and song from our guides, who were working just as hard as we were, I focused on the feet in front of me for the next 7 hours…This is where the battle of emotions tried so tirelessly to break me down. I found myself sobbing every now and then thinking what have I done? I can’t turn back. I won’t turn back. Ignoring the people being turned around and brought back down. I felt terrible for them but had to focus on my journey and not wanting to stop for too long ever because then my body would want to curl up and sleep. I was constantly running bits and pieces of my life through my head like a documentary showing me all the trials, loss, joys, challenges and milestones that have already made me who I am today. Constantly telling myself that this mental pain I am feeling right now is only temporary, my body can do this and most importantly I am stronger then this. When the sun started to show her glow I started to cry. I knew it was almost over. I was close. The horizon was a colour I could not describe to you and a photo would not do it justice. It was the most beautiful sight. From the rim (Stella Point) it was only another hour to the summit. Uhuru Peak. Reaching that sign, the finish, was actually not that at all. It was the beginning. A ‘sign’ telling that I can achieve anything I pour my heart into. The hardest thing in my life just made me so much stronger and top it off I was standing on the tallest mountain in Africa, one of the Seven Summits at almost 20,000 ft above sea level on, International Women’s Day. I was so proud of myself and my team. I just killed it on Kilimanjaro. Five of us went up that night. Three made the summit. One made it to Stella Point and the other sadly had to be taken back down to base camp and then another 10 km lower to relieve her of altitude sickness. We met up with her later that day after a short rest and continued hike down for our last night on the mountain. The next day we all walked out together. One team. One dream. Kilimanjaro is just a mountain but that climb is a journey that is different for everyone. What I took from that mountain and hold now in my heart is really indescribable, will carry me through life and help me achieve so many more amazing things yet to come. Not fancy or dressed up. Just me in my hiking stuff. Messy hair and dirty boots. My love for the outdoors has consumed me the last couple years. I'm healthier, happier and much lighter. Being outdoors in the mountains has so many health benefits. Helps with depression, weight-loss, lowers blood pressure, relieves stress, boosts immune, improves mood and ability to focus, accelerates recovery from illness or surgery...so much more. Ladies if you want to get out and hike, snowshoe, go on a backpack adventure and see what our mountains have to offer let me know. Join my Hikerbabes Vancouver Chapter and join us on one of our hikes! I guarantee once you start you will be hooked!"